Humans have always been interested in unusual, curious, and odd things. For this reason unusual collections, both personal and in museums, exist throughout the world. This interest in collecting the unusual and interesting can be traced back to the cabinets of curiosity popular in 16th century Europe. The Dog Collar Museum, at Leeds Castle in Kent, England, is an example of a once privately owned collection of unusual items now on display for the public. The Dog Collar Museum run by the Leeds Castle Foundation is billed as “a unique collection of historic and fascinating dog collars [that] has been built up over the years and is now the largest of its kind on public display anywhere in the world.” The collection started with sixty dog collars donated to the Leeds Castle Foundation by Mrs. Gertrude Hunt in memory of her husband, historian and Medievalist, John Hunt. Since its donation in 1977, the collection has grown to over 130 rare and valuable collars spanning from Medieval to Victorian times. Recently, thirty additional collars were discovered in storage and are now on display for the first time. 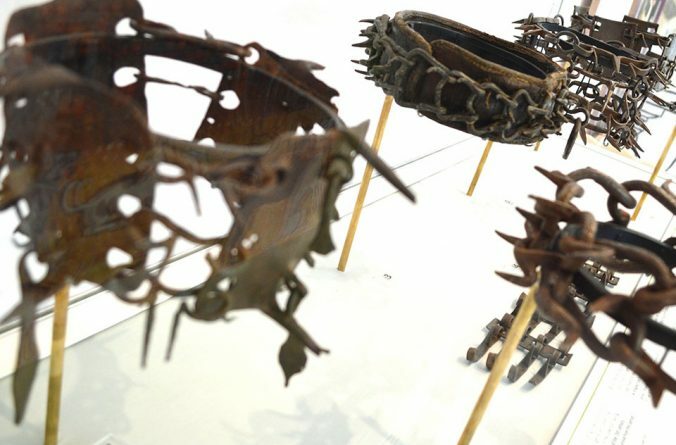 The oldest of the collars in the Dog Collar Museum is a 15th century a Spanish iron collar for a her mastiff that would have been worn for protection of the dog while on hunts. Some of the most interesting collars in the collection are the ornate, gilt baroque collars bearing inscriptions, coat of arms, and messages of the owners. The collection is housed on display in the former stable and squash court of the Leeds Castle. The castle a museum itself, was started in honor of former owner, Lady Baille. The museum aims to display the collection in a “fresh and creative new presentation–fun for children and adults alike.” It interprets the collars as not just functional objects, but as personal items that can give insight into the lifestyles and relationships between the dogs and their masters. If ever in Kent, England, be sure to check out the Dog Collar Museum and the other interesting exhibits and beautiful grounds at Leeds Castle.